This is the tombstone bearing the names of two brothers, Wilhelm C. and Ludwig Eberhard Ferdinand Bienz, located in row 1 of Zion Lutheran Cemetery, Schumm, Van Wert County, Ohio. Wilhelm C. Bienz is inscribed on the east side and his brother Ludwig Eberhard “Ferdinand” Bienz’s name is inscribed on the west side of the monument. Here rests Wilhelm, son of J & M Bienz, died 31 March 1879, age 5 months and 5 days. Here rests Ferdinand, son of J & M Bienz, died 14 February 1876, age 2 years, 8 months, and 18 days. 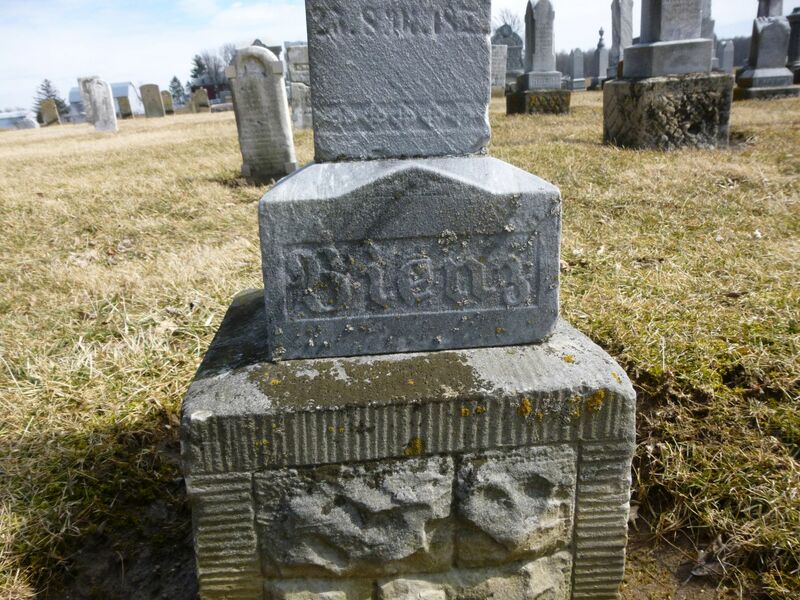 Ferdinand Bienz died of diphtheria in Willshire Township on 14 February 1876, at the age of 2 years, 8 months. He was buried on the 16th. Ferdinand’s brother Wilhelm C. Bienz is not mentioned in Zion Schumm records, in neither their birth/baptism nor the death records. 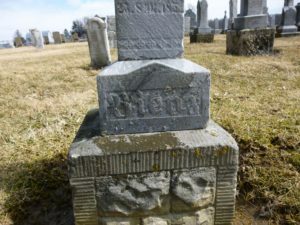 However, Wilhelm’s birth and death are both recorded in Van Wert County probate, but there is some conflicting information in the probate records. According to the Van Wert County probate birth records Wilhelm C. Bienz was born in Willshire Township on 25 November 1878 to Johann and Magdalena (Schueler) Bienz. That appears to be the only record of his birth. His birth can also be calculated from the tombstone inscription. 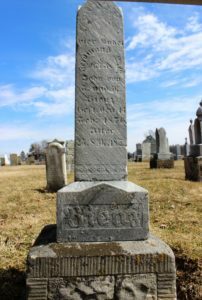 According to the Van Wert County probate death records Wilhelm Bienz died 13 March 1878, at the age of 5 years and 5 months. His death date on this record (13 March 1878) has to be incorrect because his probate birth record indicates he was born 25 November 1878, meaning his birth would have been 8 months after his death! 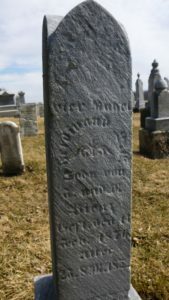 In addition, the probate death record indicates he was 5 years and 5 months old when he died, putting his date of birth at 13 October 1872, seven months after his brother Christian Andreas was born. Could be, but not likely. The inscription on the tombstone is likely more accurate. It indicates that Wilhelm died 31 March 1879 at the age of 5 months and 5 days. That would make his date of birth 26 October 1878, a month earlier than his probate birth record indicates. Still little off, but more reasonable. Looking at the other children in the Johann Bienz family, a child was born every couple of years. Christian Andreas Bienz was born 12 Mar 1872. Ferdinand was born in 1873. Martin Gottfried was born in 1875. Magdalena Anna Margaretha was born in 1881. Wilhelm would fit right in there with a birth year of 1878. The mother of these two boys, Magdalena (Schueler), was the daughter of Maria Katharina (Schumm) Schueler (1810-1838). Maria Katharina (Schumm) was the daughter of immigrant Johann Georg Schumm. Maria Katharina was an immigrant herself and married to Michael Schueler. Maria Katharina (Schumm) Schueler was the first person buried in Zion Schumm Cemetery. This tombstone is weathered and very difficult to read. We went to the cemetery last week to get a good photo of it and found the best way to read the inscription was by wrapping the stone in aluminum foil and lightly rubbing the foil with a soft-bristled brush. That method made the inscription fairly readable may be my new favorite method of reading a weathered tombstone. Ludwig Eberhard Ferdinand Bienz’s church death/burial record does not give his mother’s name, only that he was the son of Johann Bienz. However, baptism entries of some of their other children indicate that Johann Bienz was married to Margaretha Schueler. “Ohio, County Death Records, 1840-2001, database with images, FamilySearch.org (https://www.familysearch.org/ark:/61903/3:1:S3HY-6725-YC?i=224&cc=2128172 : viewed 18 Mar 2019), Ludwig E F Bienz, 14 Feb 1876; Willshire Township, Van Wert County Deaths, 1867-1908, p.102-03. “Ohio, County Births, 1841-2003,” database with images, FamilySearch.org (https://www.familysearch.org/ark:/61903/3:1:33S7-9RKX-9H4G?i=182&cc=1932106 : viewed 18 Mar 2019), Wm C Bienz, 25 Nov 1878; Van Wert births, Vol. 1:266. “Ohio, County Death Records, 1840-2001,” database with images, FamilySearch.org (https://www.familysearch.org/ark:/61903/3:1:S3HY-672V-LX?i=238&cc=2128172 : viewed 18 Mar 2019), Wm. C. Bienz, 13 Mar 1878; Van Wert County deaths, Vol. 1867-1908:130-31.